purchasing new lasers for Opthalmology will be arriving in mailboxes starting today. services at Trenton Memorial Hospital, even when least expected. pieces are critical to those with a loss of vision. the world, and serve as a reminder, in Christmas tradition, to provide light to others. 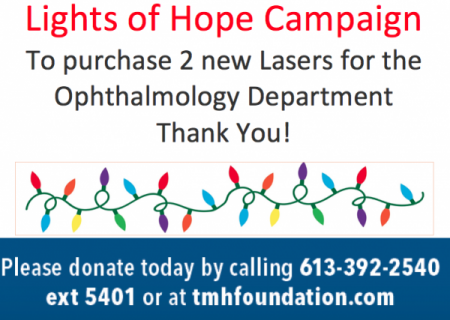 To donate go to tmhfoundation.com or contact the TMH Foundation office at 613-392-2540 ext 5401.